Retro is a thing among today’s youth: instant cameras, albums, cassettes, typewriters, 80s gaming consuls — all things hip and interesting. As far as I can recollect, retro was not a thing for youth in the 1970s and 1980s. We were interested in classic cars, to be sure, but largely we were looking forward, toward the future. I did possess a “retro” radio alarm clock that my grandmother owned in the 1960s. And I possessed a typewriter, but only as a necessity: computers were still new and expensive. My most memorable foray into things retro was an acquisition of 78s, which I purchased from the school library back in the mid-1970s (I paid 50 cents). Fortunately, my family had a stereo with a setting for 78s, so I was able to play my collection of 20 or 30 discs, a collection that included Mussorgsky’s Boris Godunov, some Bach concertos, a Mozart symphony or two, compilations of organ music, and a few discs of polka (which I later decided was not to my taste). I knew that 78 rpm was an older format, and the limits of that standard were readily apparent. I enjoyed selections as selections, but not as complete works, the running time being so limited. I did not collect these discs to be hip, but because the discs were cheap and I liked classical music. I lamented the scratches, the skips, and having to flip discs, but I endured it all for the sake of the music. When CDs were introduced in the early 1980s, I was an early adopter. Now, Arvo Part’s Passio could be heard as one uninterrupted composition. Brian Eno’s ambient music could be enjoyed at lengthy stretches. And, despite Tom Petty’s opine, discs didn’t have to be flipped. When introduced around the turn of the century, 78s were an improvement over previous formats. Entire worlds of music were opened to collectors who formerly were limited by the length of the recording. What today is retro was then practical. Still, the allure of retro remains, harkening us to a time when life was different, and connecting us to experiences lost. Sometimes the past spins at 78 rotations per minute. 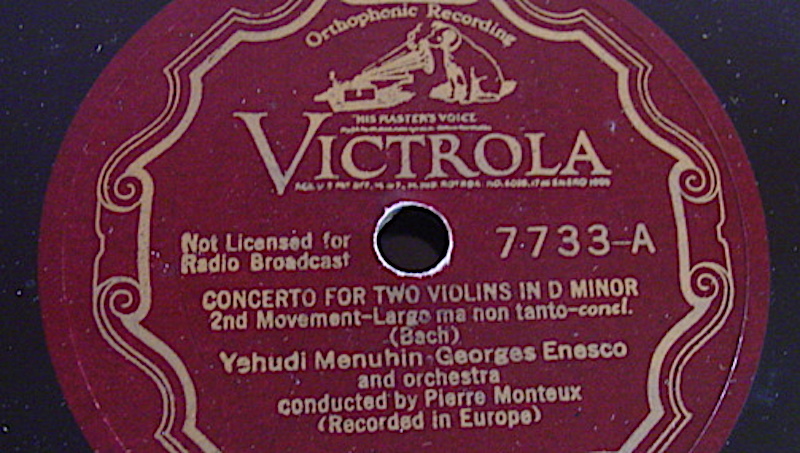 I never knew Yehudi Menhuin recorded on 78s. I thought they were before his time. I had quite a collection of 78s until a flood destroyed most of them. I even had some John Philip Sousa ones. Even though I grew up in the 60s & 70s I still liked old things. I was fascinated by them. I greatly enjoy 78’s, and old phonographs. There’s a certain authenticity to the physical sort of sound they produce, amplified by a horn rather than electricity. Gives them a character all their own. My interest in old things comes, in large part probably, from my regard for self reliance and reliability. The power going out wont stop the crank-phonograph, or the typewriter. Running out of batteries wont stop you from snapping a picture with your Kodak Autographic or keeping your pocket watch set to the right time. You’ll have a damned hard time breaking a Whal Eversharp mechanical pencil through heavy use, and by god you can rebuild an entire Model T engine with a single size of wrench.